This event on July 5-6 proved particularly good for the club’s boys with three winning gold! Sixteen members skated for BISC, 12 on the first day. Most must have been pleased with their results especially as they were generally competing in fairly big classes because the competition had a record entry, partly due to the Basingstoke Open being cancelled. BISC skaters included Harvey Clarke who was competing in his first Open and, at just six years old, was the youngest competitor. Despite a surprisingly big field of 11 skaters, James Bailey showed his superiority and won gold at Level 1, while Hannah Hetebrij won silver for artistic. Sally-Anne Adams also did well, moving up from 18th at the Bracknell Open to 8th. David Truby had a very good skate on the second day to win gold while Simon Waller not only skated two clean programmes but thrashed his opponent in the short and scored from 4.0-4.6. He is now qualified for this year’s Junior Men’s championship. Results: Beginners, girls, 9 and under: Melissa Dron, 5th, Eleanor Hetebrij, 13th, Sophie Torrington, 17th of 18; 10 and over: Olivia Wessendorff, 5th of 17; boys: Harvey Clarke, 8th of 10; Level 1, girls, 10 and under: Sally-Anne Adams, 8th of 16; boys: James Bailey, 1st of 11; Level 2, girls: Olivia Clarke, 10th, Anna Minchinton, 15th, of 18; Level 3, girls: Hannah Hetebrij, 5th of 11; Artistic, Level 3 and under, 10 and under: Olivia Clarke, 7th of 11; 11 and over: Hannah Hetebrij, 2nd of 9. Level 4, girls, 11 and under: Bethany Jarvis, 8th of 9; boys: David Truby, 1st of 3; Level 6, girls: Holly Kirkbride, 4th of 5; Junior Men: Simon Waller (1st, 1st) 1st of 2. Just two BISC members, Carol Doran and John Baster, competed in this competition in Holland on July 3-4. Because they were the organisers, they only entered one event, the Tulips from Amsterdam Waltz, but were eliminated in the heats. Helen Ingram and Basingstoke-based Adam Lester came 2nd of 3 in the novice couples class in the Deeside dance competition in May. We apologise for having omitted this from the last newsletter—but no one told the editor! Please make sure Scott Waller has details of all your competitions. Meet Matt Schofield, the rink’s new manager. Born in Doncaster, Matt, 28, studied sports and leisure at college and has worked in the leisure industry for 11 years, including seven as a manager. He started his career as an ice maintenance worker at the leisure rink at The Dome complex in Doncaster and later became rink manager there. After various roles at The Dome, he worked for Selby district Council as operations manager for three leisure centres within the district. 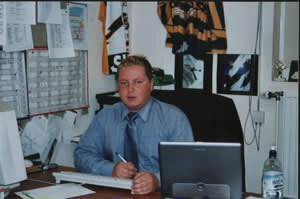 He then joined Cannons Health Clubs and Fitness First before joining LA Fitness as general manager at Bromley in 2001. He later moved to Brighton to open a new health club. His last post was as general manager for Megabowl. An avid Leeds United football club fan, his hobbies include flying. Matt replaces Tim Newton who left in June to travel round the world.